BACKGROUND: Main Types of Asteroids ... are C-type and S-type. 253 Mathilde, a C-type asteroid C-type asteroids are carbonaceous asteroids, the most common variety, forming around 75% of known asteroids. They are distinguished by a very low albedo because their composition includes a large amount of carbon. In addition to organic carbon, they contain water and phosphorus; all three are key ingredients for agricultural purposes. C-type asteroids's high abundance of water could prove useful. S-type asteroids are silicaceous asteroids with a stony composition. About 17% of asteroids are of this type. They are moderately bright (with an albedo of 0.10 to 0.22) and consist mainly of iron- and magnesium-silicates. They contain many metals: nickel, cobalt and even valuable metals such as gold, platinum and rhodium. A small 10-meter S-type might contain about 650,000 kg (1,433,000 lb) of metal with perhaps 50 kg (110 lb) of rare metals like platinum and gold. Arkyd Series 100 (The Leo Space telescope) is a less expensive instrument to find, analyze, and observe resources available on nearby asteroids. Arkyd Series 200 (The Interceptor) Satellite would actually land on the asteroid for a closer analysis of available resources. Fireflies are triplets of nearly identical spacecraft in CubeSat form launched to rendezvous with asteroids and examine them. DragonFlies deploy in formations of three similar spacecraft to gather small samples (5–10 kg) and return them to Earth for analysis. 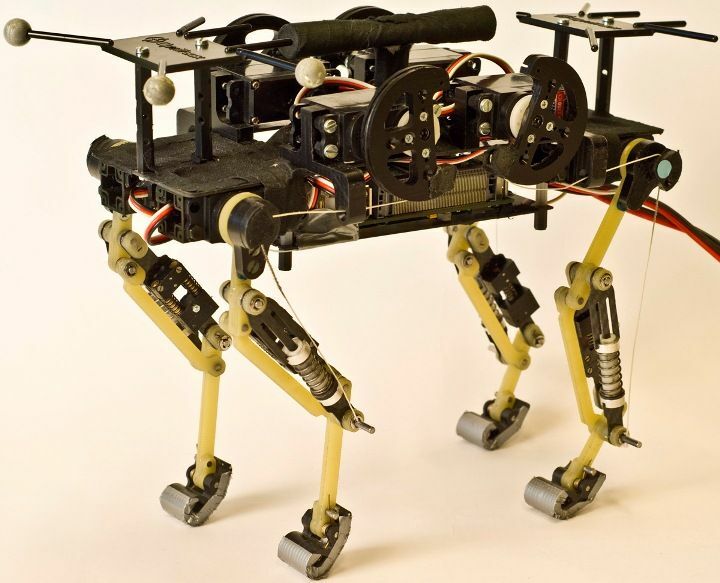 A four-legged robot, the size of a cigar box, might hop around an asteroid like a grasshopper. Some propose a robotic subsurface explorer (SSX), a snake-like device, to drill into an asteroid's regolith to determine available ores. It might drill many kilometers for comprehensive analysis. ● automatic hull repair: keep radiation out and essential atmospherics in. FOR DEEP SPACE MINING: We must develop nanobots with robust electronics to endure extreme temperatures which range from boiling hot to extreme cold, perhaps -300° F, far colder than Earth's South Pole. 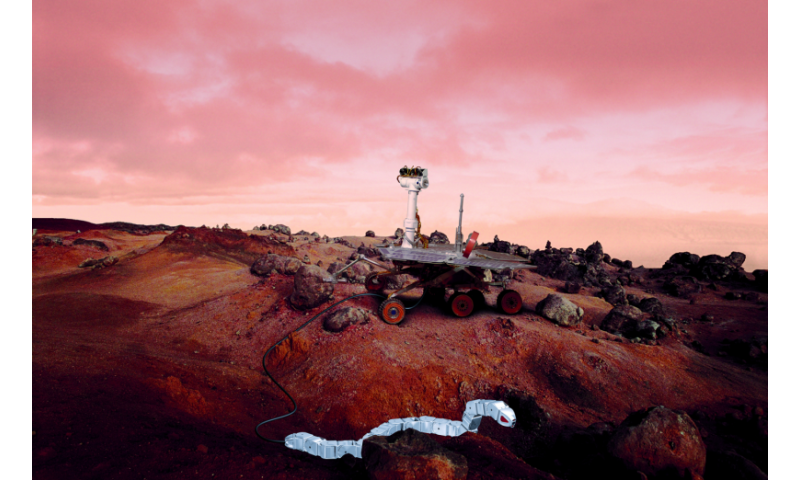 A two-legged "walking" robot might be best able to traverse rough terrain commonly found on large rocky objects such as dwarf planets, planetary moons and large asteroids. Scoop. Typical asteroid is a collection of rocks and dust. For such bodies, miners might scrape some material off the surface of some asteroids using a simple scoop. Harpoon. For some solid asteroids, mining operators could use a harpoon. A projectile would penetrate the surface to anchor the mining vessel; then, mining operators would use the attached cable to winch equipment to the surface. On the other hand, the projectile could collect surface samples and the operator could reel in the attached cable to quickly obtain samples. Shaft Mining. Mine operators can dig into a solid asteroid to extract material via a system of vertical and horizontal shafts much like traditional mining on Mother Earth. As an bonus, this shaft system might make excellent subsurface shelters for mine operators. Magnetic Rake. Asteroids with a high metal content may be covered with loose metallic grains to be gathered with a magnet. EXAMPLE: After some preliminary analysis, a habitat might extend a giant magnet to an asteroidal rubble. Volatile minerals can be extracted by simple heating. Carbonaceous chondrite asteroids have hydrated minerals, water and other volatile materials. On extinct comets, heat can melt and even vaporize the matrix to facilitate recovery of volatiles. Chemical Method: A chemical transport reaction can exploit the reactive properties of some asteroids. EXAMPLE: Carbon monoxide (CO) and nickel (Ni) readily combine at 60°C to form Nickel Carbonyl [Ni(CO)4] gas. To recover the nickel, heat the gas to a higher temp (perhaps 200°C); then, pass pellets through the gas to coat them with solid nickel for later recovery. 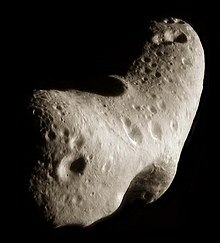 ---Use optics to analyze surface reflections of many asteroids; most promising asteroid is determined by optimizing trade offs between location and resources. ---As required, space tug can move mining habitat to another asteroid or back to cycler. ---When miner matches orbit of target, deploy AI probes for more analysis. ---When payload is ready, use tug to transport payload to cycling habitat (i.e., "cycler") for more processing. 1) Bring raw asteroidal material back to Earth for further processing. 3) Transport the asteroid to orbit around Luna, Terra or even Sol, co-located in Terra's solar orbit. Thus, asteroids would be safely processed in an optimal way by humans with much easier access to Mother Earth. to haul all the probes and robots to the asteroids. Habitat provides all the comforts of home back on Mother Earth such as spinning hull's centrifugal force to simulate gravity, reflected sunlight for energy, on-board water supply for many uses, terraformed interior for plentiful flora and fauna. Thousands of humans can happily live on board for years and perhaps their entire lives. With regards to mining, these huge cylindrical structures have considerable capacity to manufacture and transport many devices to work the asteroids. Space tug will propel the habitat into the many orbit changes needed to attain convenient position near targeted asteroid. After successful orbit change, space tug will likely separate from the habitat to do other missions: propel other habitats, transport payloads throughout the inner Solar System, etc. TRANSFORM NEA. Typical cycler will likely be a habitat transformed from a Near Earth Asteroid (NEA). A cycler trip will be lengthy, but a large internal volume and Earth-like gravity (from centrifugal force due to longitudinal spinning) can make a cycler orbit a very pleasant voyage with many traveling companions (easily 10,000 passengers). ● Avoid Luna. Carefully plan cycler orbit to not collide with Earth's moon. ● Adjust inclination (i) as needed to access more celestial objects. For access to many more Asteroid Belt Objects (ABOs) throughout the region between Mars and Jupiter, cyclers need to pursue bigger cycles of three and even four years. Note a 5 year cycle extends to near the orbit of Jupiter. TE assumes max practical absence away from Mother Earth to be four years, length of typical college education or perhaps a hitch in the military. Thus, consider the 4 year cycle as optimal trade-off between asteroid access and time away from Earth. Furthermore, maintain the sensible method of annual earthly rendezvous by properly spacing four habitats throughout the cyclic orbit. Thus, a cycler rendezvous with Earth would be an annual event. EXAMPLE: Cycler rendezvous could happen every year at March 20. To gain even more access to ABO region, we could add more four year cycler orbits, each orbit would rendezvous near Earth at a different date. EXAMPLE: We could design a 4 year Alpha (α) cycle to rendezvous a cycling habitat every March 20. In similar manner, we could design three other 4 year orbits, beta (β), gamma (γ), and delta (δ); their rendezvous dates could be June 20, Sep 20, and Jan 20, respectively. This could give us a total of 16 deployed cyclers; one of which would rendezvous with Earth on every calendar quarter. Self-Replicating Habitats: To create this many and more cyclers, TE assumes considerable space borne capability; thus, cycling habitats will likely acquire and refine large amounts of asteroidal regolith to create even more habitats. In effect, such vessels might copy themselves (self-replicate) with in-situ materials. A 1980 NASA study, proposed a Moon based factory which would automatically self-replicate. Since that study, there has been major progress in: robotics, miniaturization, nanotechnology, Materials Science, and additive manufacturing; thus, automatic, complete replication of in space facilities is even more feasible. CO-ORBITING HABITATS: Alpha and Omega. Habitat α could lead Terra by 60°, and Habitat Ω could lag Earth by 60°. Both habitats could be safe havens for receiving resources from mining missions. Purpose. Cyclers could harvest asteroids/comets throughout the Asteroid Belt and bring them to Earth for final processing. However, huge chunks of extraterrestrial material in orbits around Earth presents some impact risk. To reduce risk to either Terra or Luna, one should place these habitats well away from Mother Earth; in this instance, both are 1 AU from Earth. Omega/Alpha colonies could process cycler payloads at a safe distance from Terra, their Home Planet. At 1.0 AU from Earth, these habitats could safely harvest Asteroid Belt Objects (ABOs) located throughout the wide spaces between Mars and Jupiter. To efficiently harvest the vast resources of the Asteroid Belt, habitats need to travel in 4 year cycles. To safely process asteroidal materials, they should go to large colonial habitats located at positions Alpha and Omega in Earth’s orbit. The donut-shaped asteroid belt is between orbits of Jupiter and Mars.